Potticks House is Grade II listed and was contructed in the late 18th century of Bath stone under a Welsh slate roof. The front façade is a classical example of symmetrical Georgian architecture. The 19th century Victorian conservatory and wing were added later, creating a large family house with superb gardens and grounds. The property boasts a number of period features inside including large sash and French windows, original joinery, and window shutters. The ground floor is laid out with the entrance/dining hall, sitting room and conservatory facing south to benefit from the natural light, while the kitchen leads through to the drawing room with a further dining area and French windows opening out to a beautiful terrace. Upstairs are the large master bedroom suite, a substantial dual aspect home office with views over the formal gardens and a further two double bedrooms sharing a shower room. There are two single bedrooms on the first floor and two double bedrooms on the second floor with a shared bathroom. 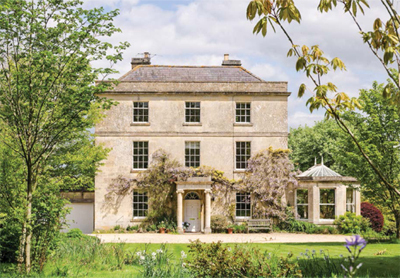 Outside, the outbuildings were constructed in the late 20th century of Bath stone in a style to match the main house. They provide excellent ancillary space a toolshed and secure storage for garden machinery and equipment. The pool house/changing room also houses the pool pump and there are a further store and large open lean-to. The gardens and grounds are a feature of the property. The garden in front of the house is lawned with mature specimen trees and in spring, areas are carpeted in daffodils, and bluebells. The gardens also have a notable collection of peonies and many rare shrubs and trees. To the side and east of the house is the wide terrace, accessed by the conservatory and drawing room, with various planted and potted shrubs and perennials. The terrace leads on to a wide lawned area and on to the largest of the two paddocks. Behind, the formal garden has roses and pears and with mature yew hedging. A stone flagged path, lined with flower beds, leads down to a pretty secluded enclosure with the large gallon swimming pool and pool room. Further afield, there is a large vegetable garden with greenhouse and beyond is an informal area of orchard and woodland with serene walks down to the bottom of the garden. Another paddock lies to the east; the grounds come to around ten acres. Potticks House lies just one mile to the northwest of the Saxon town of Bradford-on-Avon which has a good range of day-to-day amenities. The City of Bath with its world-famous Roman baths, is only six miles away. The guide price is £1.85m. For further information please contact Knight Frank on 020 7861 1528 or visit www.knightfrank.co.uk.